Bus transportation to and from camps is included in the camp fee. Door to Door service available for additional cost. Transportation is from central locations including the JCC in Squirrel Hill. Door-to-door service from certain locations is available for an additional fee. Buses are equipped with two-way radios and bus drivers are carefully screened. Our office has a radio that connects directly to the central communication office and each individual bus, our Counselors ride buses with campers. Each bus has a designated staff person who serves as a bus monitor, supervising other staff and ensuring safety to and from camp each day. We email bus pickup times one week before the start of camp.J&R Stepping Stones campers take a dedicated bus with seat belts and counselors to and from the JCC in Squirrel Hill. 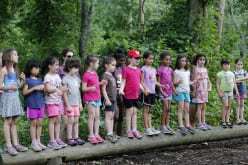 Families provide transportation to and from camps based in the Robinson Building, 5738 Darlington Road, Squirrel Hill, where children are greeted and signed in each day. Drop-off and pickup is supervised and facilitated with carpool lanes.